BITTER gourd is one of the most disliked vegetables because of its taste. But given its nutritional and medicinal value one is often forced to eat it. However, over the past three decades, this vegetable’s bitterness has reduced, thanks to the hybrid varieties created by scientists in India. These hybrids—pusa do mausmi, pusa vishesh, arka harit and many others—are commonly available and differ in their shape, size, colour and taste. Scientists have now crossbred six other less popular members of the gourd genus found in India. These include teasle gourd (Momordica subangulata), spine gourd (Momordica dioica), sweet gourd (Momordica cochinchinensis), balsam apple (Momordica balsamina), Momordica sahyadrica, known as vaika in Kerala and Momordica cymbalaria, called athalakka’i in Tamil Nadu. Apart from teasle gourd, which is produced commercially and considered a delicacy in West Bengal and Odisha, the cultivation of other species is restricted to tribal and poor farming communities. But the lesser known gourds have a huge potential as alternative crops as they are loaded with medicinal properties and nutrients. For instance, in Odisha, sweet gourd is used to treat asthma and anaemia. 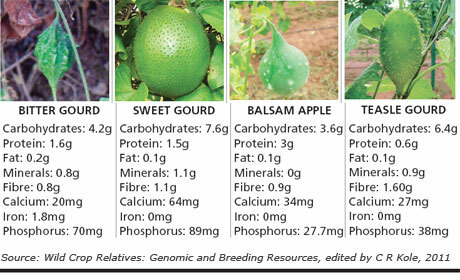 So to make these nutrients commonly available, L K Bharathi from Central Horticultural Experiment Station in Bhubaneswar and colleagues crossbred different species of gourd, including the two varieties of bitter gourd—wild (Momordica muricata) and common (Momordica charantia). To do so they dusted pollens from the male flower on to the female flower by hand. The seeds so formed were sown in trays containing farmyard manure at a temperature between 25°C and 30°C. The seedlings were raised in earthern pots containing soil, manure and sand. “Inter-specific crosses can improve crops by transferring traits like pest and stress resistance,” says Bharathi. The scientists were also able to ascertain the crossability patterns for the different species in the genus. This data, they say, can serve as a blueprint for further hybridisation programmes. They found that the two varieties of bitter gourd exhibited high crossability whereas crossing between other species had varied results. For example, teasle gourd showed high crossability with spine gourd and vaika and low crossability with sweet gourd. Momordica cymbalaria was not crossable with any other species. The results were published in the July 25 edition of Current Science. 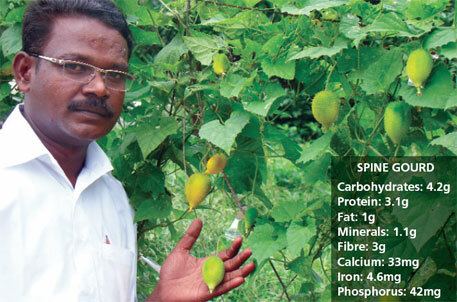 “Research is on and new varieties will hit the market soon,” adds Bharathi.